Little Dude has only recently graduated from picture books to proper story books suitable for toddlers. Even though we love storytelling (see this Storytelling Props activity we did), it didn't occur to me to find new books for him as he loved his picture and word books so much! but since he turned three, we have added quite a few new books to his library, and now he loves them all. 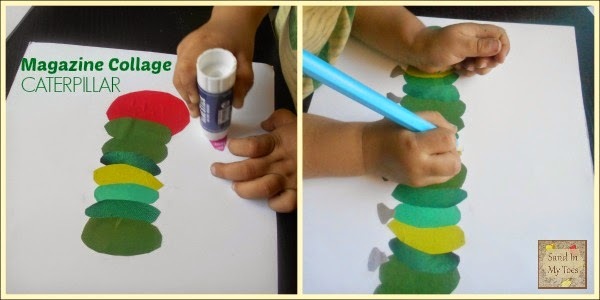 One of his favourites is The Very Hungry Caterpillar by Eric Carle. At first, I had no idea why this modern kids' classic is so popular. But when I read it a couple of times, I realized how its simple and imaginative storytelling is great for children. And of course, I love the illustrations! So, we've done our first craft based on a book. 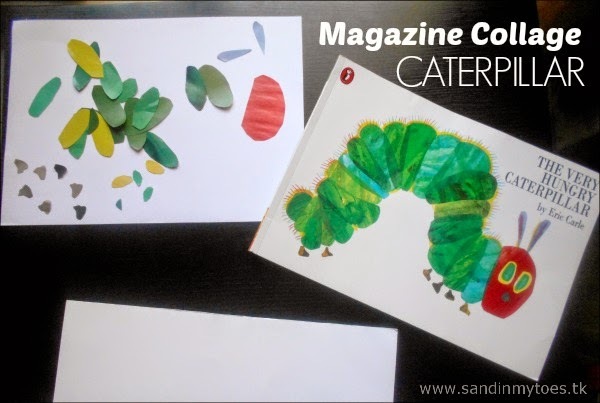 Inspired by Carle's designs, I thought printed magazine scrap paper would make a great caterpillar. 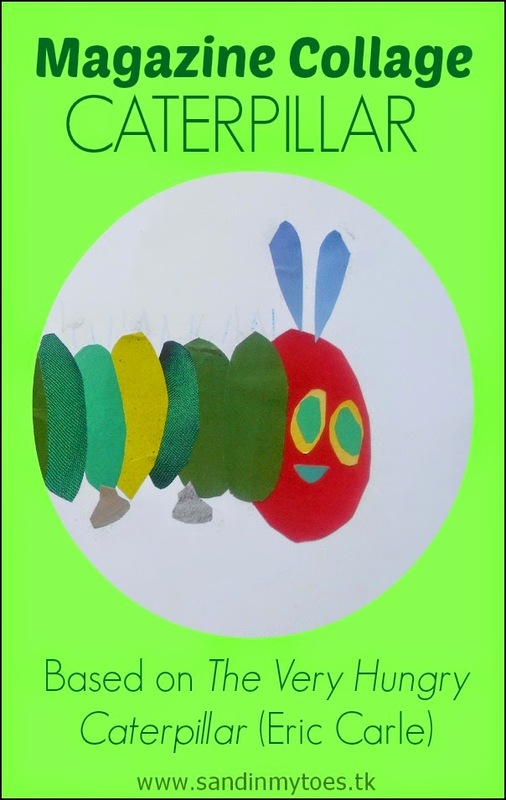 With the book's cover design as inspiration, I looked for similar colours in magazines, and cut out the shapes for Little Dude to assemble into a caterpillar like the one in the book. I let him look at the cover while helping him make this caterpillar onto a card sheet. He started with the head, and glued parts of the body one by one. 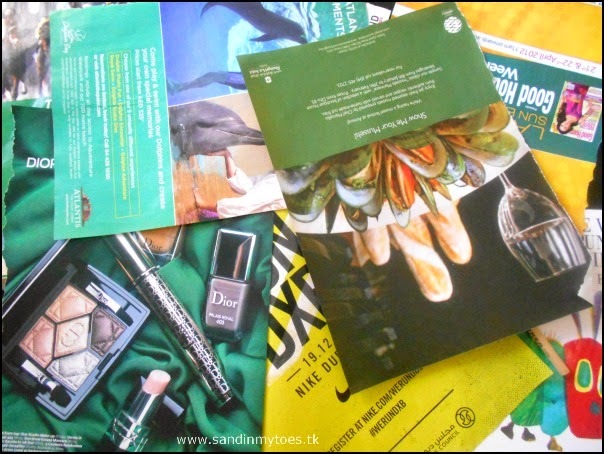 I encouraged him to mix up the different shades of green to give the same effect as the original illustration. Once the caterpillar was glued in place, he drew its spiky hair with a blue pencil. In the end, we also added a sun to the picture, and I love the way it has turned out! 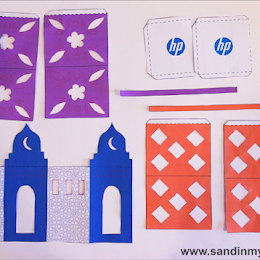 If your child loves this book, and cutting and pasting (with help from you, of course), this would be a fun activity for you to do together! How gorgeous! 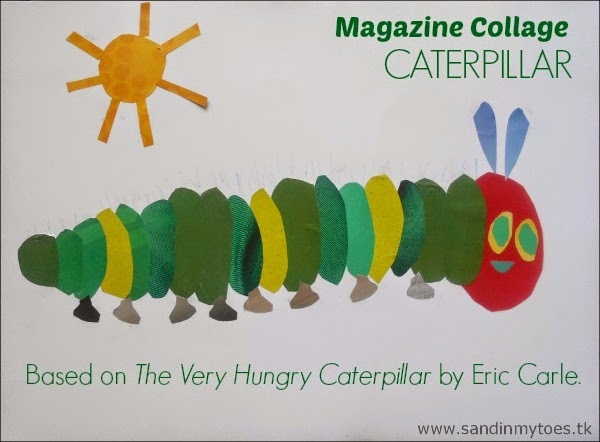 I can imagine the caterpillar has slightly different textures too from the different magazines. That caterpillar is fantastic. 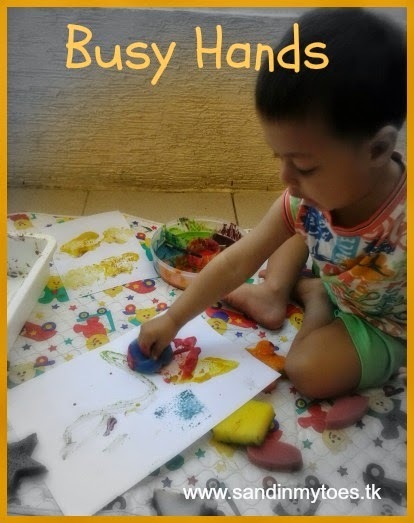 It's great the way books can inspire play/craft and it brings the book to life. Yes, the paper differences created a nice texture! Thank you Karen! We hope to do more book-based activities in future. Yes, it certainly does! I love the simplicity of the book. Such a great idea!! Will be trying this out with Little A during the winter break. Very cute idea. 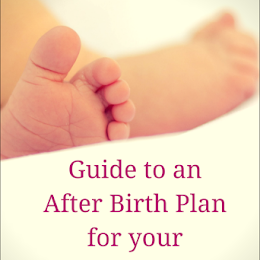 The magazines add that nice color and glossy paper. 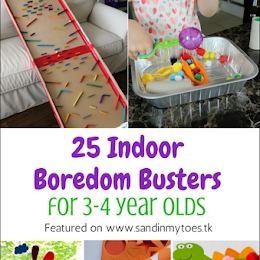 What a fabulous activity and it looks good fun too. This is such a cute idea and based on one of my favorite children's books.